With the advent of digital cameras, bird photography has become increasing popular over the years. The great thing about birds is that you can pretty much find them to photograph anywhere - whether it's your back garden, nature reserve or zoo. Most birds don't like to be approached, so using the longest telephoto or zoom lens that you own is normally best since to get fine detail from a bird shot it will need to be fairly large in the frame. It's best that before approaching a bird you think carefully about what it's likely to do. It's worth watching from afar for a while to see if the bird has a routine, for example maybe it returns to a certain post or tree regularly. The more you know about your subject the easier it will be to get close. Once you've managed to get nice and close to the bird you wish to photograph and before you press the shutter, consider the following 5 tips that will help you to get a great shot! Where possible try not to shoot from above or below your subject. One thing that will really make a bird photo stand out is getting to the level of the bird thus taking the viewer of your images into the bird’s world. Another benefit is that by having the camera’s image sensor parallel to your subject all of the bird will be on the same plane of focus and therefore more of the bird will be sharp. Always try to get on the same level, whether it’s on the ground or perched in a tree. Being at eye-level brings an intimacy to your shot that you don’t get if you’re shooting up or down at a bird. Because the bird will be parallel to the camera, the image of the bird will be sharper and the background and foreground will be nicely blurred. change the look of your shot. The background of your photo can really make or break your shot. To make the bird stand out in your shot you need the background to be nicely out of focus without any distractions. The most pleasing shots have a solid colour for a background. This is achieved by using an aperture on your camera of around f/4 to f/5.6 which gives a nice silky smooth look to the background without the depth of field being too shallow which would cause loss of sharpness in the subject. Another, and more difficult, way is by using Photoshop to blur the photo in post production. This however takes a lot of practice and, if done incorrectly, can make a shot look unnatural. When lining up a shot pay close attention to the background as well as the subject. Try to get a background with a solid colour. Using a low aperture setting will help remove any distractions from behind the subject. The smooth background on these shots really makes the bird stand out. Although camera light metering systems these days are very good, it is very easy to overexpose whites and underexpose blacks of a bird’s plumage. If this happens you can potentially lose any detail in those areas and ruin your shot. It's highly recommended that you shoot in RAW mode as, within reason, if you have made a mistake when taking the shot you can amend the exposure in post-processing, "saving" images that if shot in JPEG would have been lost. However it's not always possible and can't be used as a substitute for correct exposure. A popular way of checking that the shot has been exposed correctly is to check the image’s histogram after taking a shot. If the distribution in the histogram is towards the left hand side of the graph, it's underexposed and If it is towards the right hand side of the graph, it's overexposed. A well distributed histogram (in the middle) will confirm a proper exposure. As an alternative to the histogram, your camera will probably have a highlight alert option that will show any overexposed areas by flashing them when you review the image. This is certainly a quicker way to determine if you're blowing out the detail than studying the histogram. If you have discovered that the shot is incorrectly exposed (using either method) you can either adjust your shutter speed accordingly or, if shooting in AV (Aperture Priority), use the camera’s exposure compensation facility. This allows you to manually override the camera’s metering by over or underexposing every shot by a set amount. This does not means that you're setting the actual exposure, that is still determined by the camera's computer, however you are telling the camera that you are not satisfied with its metering and adjusting them slightly. Use evaluative metering. For most scenarios this is best and it is often the simplest to use. Turn on the "Highlight alert" feature if your camera has it. Once you have enabled this you can take a test shot then view it in playback mode on the LCD. If you’ve overexposed any areas, those areas will blink showing you that a change in setting is needed. Use the camera’s “Exposure Compensation” feature. If the camera’s metering isn't exposing the way you want it to, this allows you to adjust it. Black and white birds are normally a nightmare to correctly expose. exposure compensation to ensure the birds breast wasn't over exposed. Probably the most important element of a bird photograph is not the bird, but its eye. It needs to be clear and sharp and with a visible catch light. A catch light is a reflection of a light source in the eye of a subject and is highly desirable in a shot as it really gives the bird "life". Shots without catch lights have nowhere near as much draw as shots with them. When focusing your shot the autofocus point should always be on its eye. There are lots of poses which are pleasing but an action shot is almost always the most interesting. This isn't to say portrait/stationary shots aren't any good as in some cases they can be just as pleasing to viewers as intense action shots. One of the best opportunities for capturing interesting poses is photographing birds when they're feeding. In this situation the bird will be alert, moving and in some cases more approachable than normal. This will enable you to capture a number of different poses and, if you’re lucky, a shot with prey/food in their mouth. Capturing bird behavior can really give your shot an edge. Knowledge of your subject is also a great help when capturing something out of the ordinary. Whether it's a tell tale sign that the bird is about to stretch its wings or maybe to fly off - if you know these signs you're one step ahead and more prepared to capture the shot. It's worth however bearing in mind that just because the shot has action, doesn't mean it's a keeper. Although it can be very frustrating, if the shot isn't sharp or the bird is facing away then nine time out of ten, it's for the bin. The first shot is nice but the lack of eye contact ruins the shot. Lucky for me it decided to look straight down the lens. Eye contact really makes a shot. The eye contact draws the viewer in and will be the first place a viewer will look so it needs to be sharp and ideally looking straight at you. You should also always try to get a catch light in the eye. This again gives a more natural feel to the picture and gives the subject life. Learn about your subject. 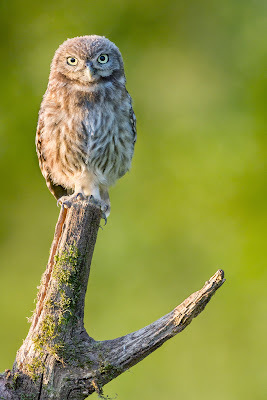 Knowing what the bird is going to do before it does it gives you a much higher chance of capturing an interesting pose. Even if the shot has action or an interesting pose, you can't neglect the basics of photography. So if it's not in focus, let it go. The aim of composition is to make a photograph more pleasing to your eye and to that of the viewer. Getting it right can really make or break a shot. When lining up a shot it is not always necessary to get the composition right in the field. If you make sure you have enough space around the bird you can re-compose it later. You will almost always need to re-compose a bird photograph in the post processing stage. 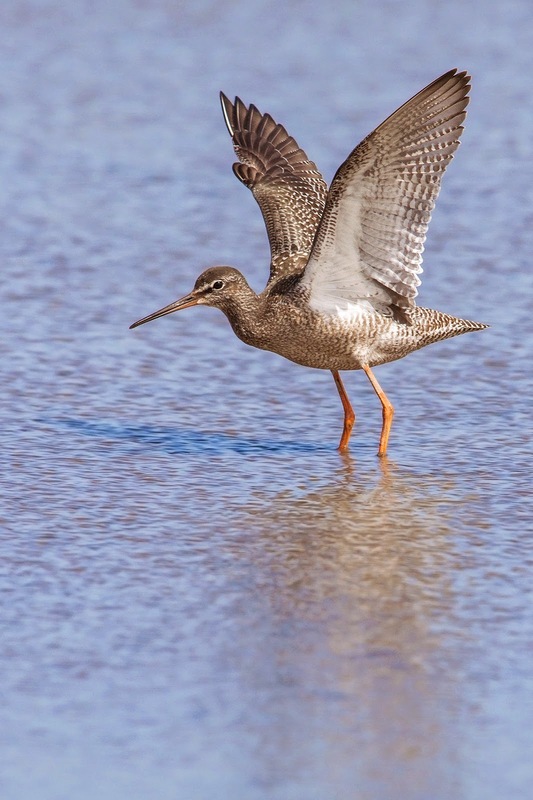 Arguably the best composition for bird photography is the rule of thirds. The idea behind this is to get the major features of an image (e.g. eye or head) to align with the imaginary vertical or horizontal lines that divide the image’s axes into thirds. By moving the position of the bird to one of these axis points you can drastically change the feel of the shot. What this will also give you in space in front of the bird which gives the shot a more natural feel as the bird has "space to move". You should normally aim to make the bird around 30-80% of the image. If it's smaller than this, the bird will look lost; any bigger and it will be too much. The rule of thirds is by no means the answer to every shot. 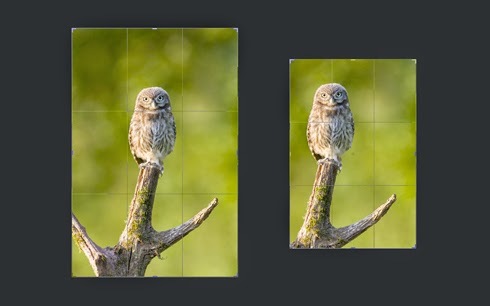 If the image looks good, then it's probably composed correctly, although it's surprising how often the images that do look right use the rule of thirds. Composition can make or break a shot. It's worth taking your time to get it right. Size matters. Make sure the subject is not too big and not too small. The rule of thirds works very well with bird photos but it's not always the answer. If the shot looks right, it probably is. 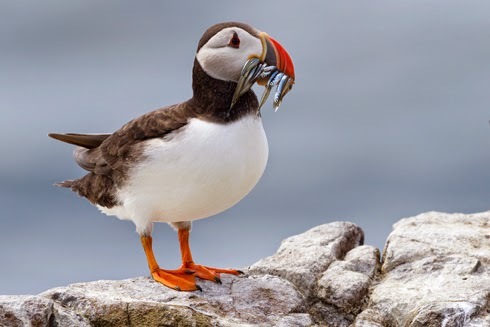 For years, I've wanted to travel to the Farne Islands to take some shots of hundreds and thousands of different birds (of which 35,000 are Puffins!). In 2014 I managed to make this trip – read about how I got on and to see some of the shots I took. You can also learn about the range of kit I used. We also have a Wildlife course at our Burgess Hill store on Saturday 14th March 2015 with professional photographers George McCarthy and Adrian Davies. If you’re unable to make this event, we will have future events at Park Cameras, or we sell a book by Ross Hoddinott & Ben Hall offering even more tip and tricks to help get great photos of wildlife. CLICK HERE for details.